Conflict between past members of Tull? 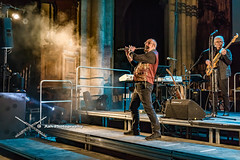 Ian Anderson once mentioned that, while he got along well with every musician that has ever been in Tull, some of them did not see eye-to-eye with each other. Which band members do you think had disagreements (and perhaps even hostility) between them and why? with every musician that has ever been in Tull, some of them did not see eye-to-eye with each other. Which band members do you think had disagreements (and perhaps even hostility) between them and why? Awhile back there was alot of 'He said - He said' stuff about why Martin was let go. For every other member it appears the reasons were not about why but when. Regardless of the reasons, Ian Anderson made most decisions which were usually private. Although I get a little curious I tend to ignore the Tabloid gossip which is rampant on the internet. Even Glenn Cornick refused to indulge most questions although he felt the circumstances were difficult. If I worked for TULL and lasted a week like Tony Iommi, I would have considered it an honor. Then again Black Sabbath may never have existed without the departure that happened. It must certainly get a bit fractious in a band if you're with everyone 24 hours of the day on a long tour of the States with all the travelling involved and basically playing the same music every night for 6 months. I think Clive Bunker did the right thing and handed in his notice well before the end of the tour they were on. I think there was a fall - out with Mick back in the day but made up since. There's always been fall- outs between band musicians especially at the beginning of their career. The mix of musical differences, personalities, ambition, recognition and competition can make ego's soar! And not necessarily just a clash of egos -if one or two members are not as focused as the rest or the individual who's calling the shots, then that can cause a lot of tension. But that happens anywhere. I remember from first hand experience (not Tull!) little cliques and whispered 'conference meetings' about certain things that 'the drummer' was or wasn't doing - like not turning up or turning up wasted. It's always the drummers fault !! Very well put Sir! I hate gossip because no good ever comes from it. From the standpoint of over 40+ years in some cases, it would be difficult to know many of the difficult ups and downs surrounding the group. Mick is a case in question - was he fired by management or by the band? Nobody can be sure now but on the plus side had he stayed with Tull for Stand Up we might never have heard the Blodwyn Pig albums Getting To This or Ahead Rings Out and musical history would have been a heck of a lot different. See my Book "Jethro Tull - the parallel universe history of the band"